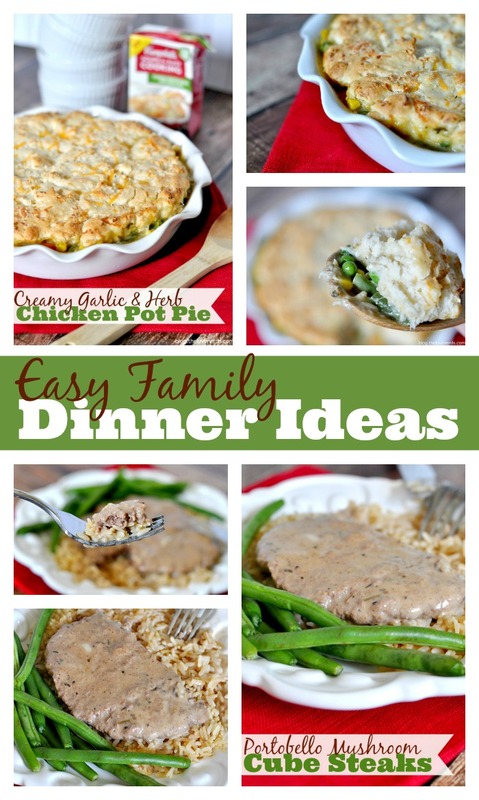 You are here: Home / RECIPES / Dinner / TWO Quick and Easy Family Dinner Ideas! Whenever I think about sharing a recipe on the blog with all of you, I always ask myself: “Is this recipe reasonable for the average family?” I love to experiment in kitchen and try something fancy every now and then, and will of course share those with you now and then, but really we are an average family who needs easy, approachable recipes – hence TWO easy family dinner ideas for you today! Our normal evening goes something like this: Bryan gets off work at 5, chats with me for a little bit, lingers while getting ready for his work out – usually getting side tracked by something on his phone for awhile – and then goes to work out. He doesn’t normally get back until 6:30 and then showers and gets ready. In the mean time, I am still working. Between the blog and multiple clients I work for, I work until the very last possible second before getting off the couch and putting dinner together. So I NEED easy and the easier the better! Enter Campbell’s into my life! I have shared recipes with Campbell’s products before, including this 10 minute Clam Chowder recipe we love, so I was super excited to try there new line of Campbell’s Soups for Easy Cooking. They are pourable, seasoned cooking soups that make meal prep even easier! That’s right – easier! First I decided to try their Creamy Herb & Garlic with Chicken Stock. When I normally make Chicken Pot Pie, I make a cheesy sauce to pour in which normally takes me at least 20 minutes to prep with a constant eye. Delicious but the effort made it more a Sunday night meal than a rushed Monday dinner. So this week, I decided to use the soup instead and my Creamy Garlic & Herb Chicken Pot Pie was delicious!! I can’t believe how fast this meal came together. I threw the chicken and a microwaved bag of steamed vegetables into my pie pan and poured in the Campbell’s Creamy Herb & Garlic. Then, I whipped up a biscuit mix, adding in some cheddar cheese, and topped off the mixture. Done! Dinner prep took under 10 minutes and then it just needed to cook for 30 minutes. 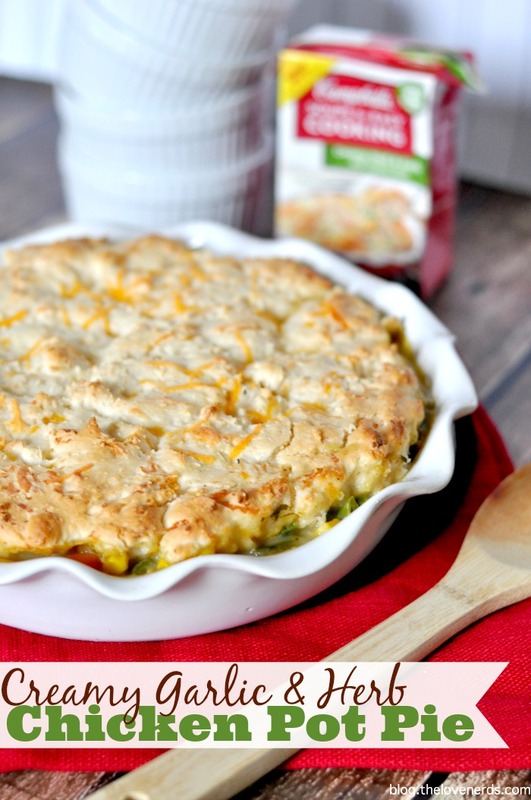 10 minutes of prep and you will have a Creamy Garlic & Herb Chicken Pot Pie with a Cheddar Biscuit Crust! 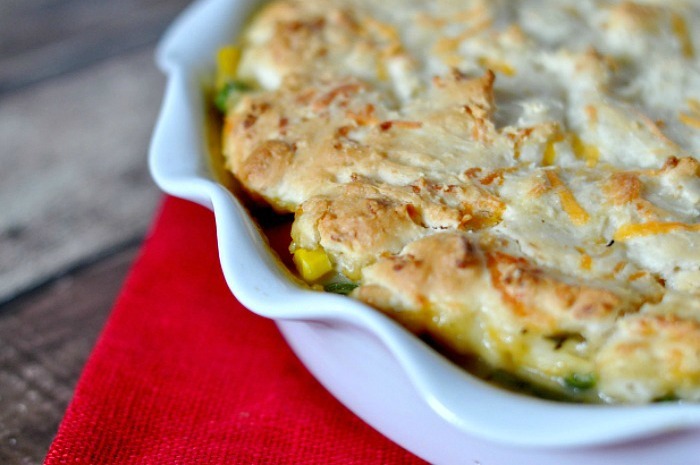 Add the chicken and almost cooked vegetables into 9" pie can or a casserole dish. Pour in the soup and mix well. In a medium bowl, combine Bisquick and milk to make your biscuit topping. Then mix in the cheese. You can always use your own biscuit mix or a different brand. Spread the biscuits on top of the pot pie mixture. You might need to use your fingers a little bit to help spread the mix around. It doesn't need to be perfectly even (the mix will spread and rise). Bake for 30 minutes or until the biscuit topping is wonderfully golden! I don’t know about you – but I determine the easiness of a dinner not by the COOK time but by the PREP time. As long as I don’t need to be actively cooking in the kitchen for more than 30 minutes, I consider it manageable for almost any night of the week, which takes us to our NEXT easy dinner idea! Cube steaks are to me an underrated cut of meat. 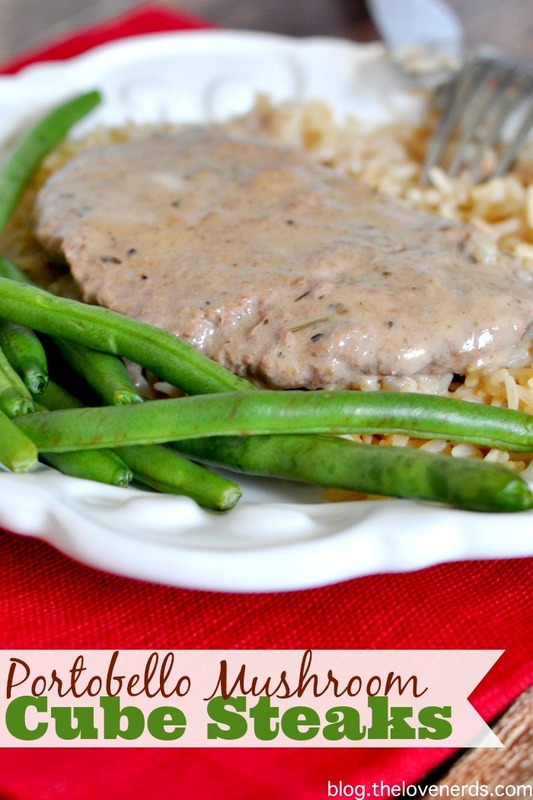 I don’t see them being used very often in recipes but they are so easy to work with and have great flavor. My mom always makes a French Onion version which I have shared with you before, but we are a mushroom household here. While I didn’t always eat mushrooms, I am always looking for ways to incorporate them into our meals because my husband loves them. So can you guess? I made Portobello Mushroom Cube Steaks! Using Campbell’s Savory Portobello Mushroom, I quickly seasoned the cube steaks with a little garlic salt, placed a layer of the steaks on the bottom of a casserole dish, then a layer of the soup and repeated. To top it all off, I added a can of beef broth to make sure the steaks stayed really tender and to help make a nice gravy at the end of the cooking process. DONE! It took me 5 minutes and I covered with tin foil and put in the oven. Now, this recipe does take longer to cook – 1.5 hours in the oven. With only 5 minutes prep work though, it didn’t feel like a pain to quickly get up after Bryan is off work to put it together and then it be ready when he gets home. Plus, it has the BEST mushroom flavor. So yummy! Calling all mushroom lovers!! 5 Minutes of prep work and you get these delicious Portobello Mushroom Cube Steaks! Season your Cube Steaks with garlic salt. Add a layer of cube steaks to the bottom of the casserole dish. Add a layer of soup on top of the steaks. Pour in the can of Beef Broth. Cover with tin foil and cook for 2 hours. Now, I am REALLY excited to see what you also come up with. Seriously! I want to hear your ideas and your creations so I can make them, too. That’s how much I love Campbell’s. I have already mentioned the Creamy Herb & Garlic with Chicken Stock and the Savory Portobello Mushroom, but you will also find Sweet Onion and Mexican Style Tomato. I also Campbell’s so much because of their awesome website and how many easy recipe ideas they share, so you will want to check all of them out! Plus, you can always follow along with them on Facebook, Twitter and Pinterest! The best part is that there is a coupon for you to use when you head over to Walmart to pick some up like I did. 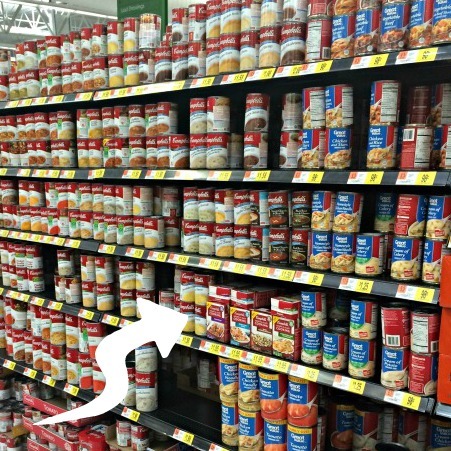 Just head on over to the soup aisle and look for the little boxes. Not cans! You will save $.75 on Campbell’s Soups for Easy Cooking with this deal, good through 4/13/15. Enjoy and don’t forget to come back and tell me what you made!! My best friend asks for chicken pot pie all of the time! I’ve always thought it would take forever, but this I think I can do!